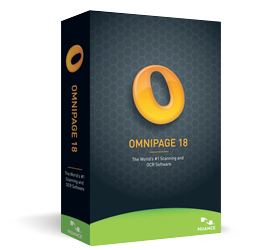 OmniPage 18 is our entry-level scanning, document conversion and OCR productivity application. It delivers the most accurate document conversion available, turning paper and PDF files into electronic files that you can edit, search and share. OmniPage 18 ensures that your converted electronic documents look exactly like the original – complete with text, graphics, columns, tables and more. Improved OCR engines deliver superior accuracy for document conversion and archiving business-critical documents. Converting documents doesn’t have to be complicated. The Quick Convert View gets it done in seconds – without the need to learn a lot of options and tools. Convert documents stored in Windows Live SkyDrive, GoogleDocs, Evernote, Dropbox and many more. Includes the Nuance Cloud Connector powered by Gladinet. Turn any PDF file into your favourite PC application for easy editing. You can also scan documents into searchable versions of these formats for instant access by desktop search utilities. If your device can scan, then it can work with OmniPage. Mobile scanners, desktop scanners, all-in-one devices and multi-function printers all work more productively and with better accuracy using OmniPage. Capture text with a digital camera or iPhone®. Quickly convert your pictures to text documents with the Nuance’s most accurate 3D correction technology. Scan a document, automatically convert into a readable format and send it to the Kindle® electronic book reader in one easy step. Process, edit and store documents from anywhere in the world. OmniPage includes the recognition of languages based on the Latin-, Greek- and Cyrillic alphabets as well as the Chinese, Japanese and Korean languages. PDF files are everywhere and can come from a variety of sources. They can include scanned pages, embedded images and other types of information. Yet many of these elements don’t include searchable text.The new eDiscovery Assistant for searchable PDF is a revolution in safely converting a single PDF or batches of PDFs of all types into completely searchable documents. Now you don’t have to open PDF files one by one or use an OCR process that might unintentionally wipe out valuable information. Download input files from web storage sites and return recognition results there. OmniPage provides native integration with Evernote® and Dropbox. In addition, the included Nuance® Cloud Connector application provides access to a number of cloud services including Windows Live SkyDrive, GoogleDocs, Box.net and many more.The added benefit of the Nuance Cloud Connector is its ability to integrate directly with Microsoft Windows, providing easy drag-and-drop access directly to cloud services. The Nuance Cloud Connector is also upgradeable to a more feature-rich version of the product called Gladinet Cloud Desktop Pro. This enhanced version adds additional functionality for using cloud services for automatic backup and file synchronisation. Windows 8 / 8.1 32-bit or 64-bit editions, Windows 7 32-bit or 64-bit editions, Windows Vista 32-bit or 64-bit editions with Service Pack 2, Windows XP 32-bit edition with Service Pack 3. A computer with a 1 GHz Intel® Pentium® or higher or equivalent processor. Multi-core processor recommended for advanced performance. 512 MB of memory, 1 GB recommended for advanced performance. 250 MB of free hard disk space for the application files and sample images, plus 100 MB working space during installation. An additional 230 MB for RealSpeak™ Solo speech modules. 30 MB for Nuance Cloud Connector. 1024x768 pixel colour monitor with 16-bit colour or greater video card. WIA, TWAIN or ISIS scanner driver. 2-megapixel digital camera with auto focus or higher for digital camera text capture. Web access needed for online Activation, Registration, Live Update and Nuance Cloud Connectors.